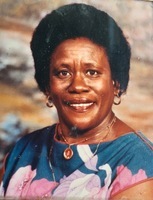 Provide comfort for the family of Maximena Miller with a meaningful gesture of sympathy. We encourage you to share your most beloved memories of Maximena here, so that the family and other loved ones can always see it. You can upload cherished photographs, or share your favorite stories, and can even comment on those shared by others. Provide comfort for the family of Maximena Miller by sending flowers. God is truthful and loyal to all those He loves and I know He loves you Mama. I am sorry for many things and one is not being there to see your final resting place. In having regrets, I take comfort in the fact that I know that God loves you and we will see the sun rise again. Rest in peace Mama. Rest in sweet peace Mama. Love and sympathy to my Grandma Doreen and Aunt Sonia on the loss of their mother.